What happened to "A Second Perspective" at All The Wonders? Eds. note, 3/30/17: Please see updates to this post, including Matthew Winner's explanation. On Wednesday (March 22, 2017), I reviewed The Secret Project by Jonah and Jeanette Winters. 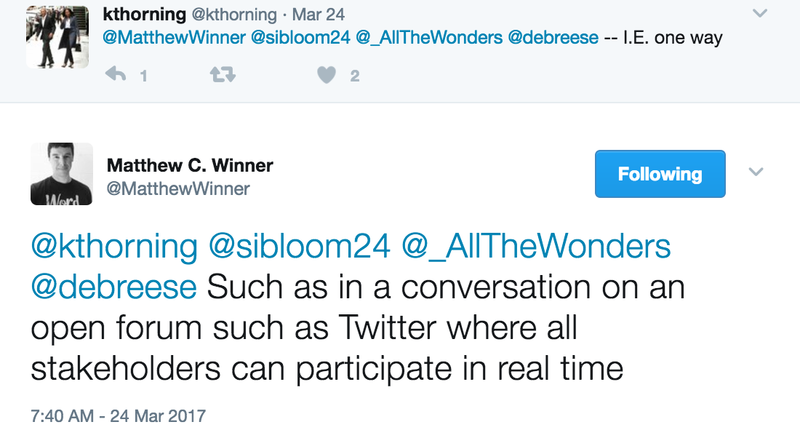 On Thursday morning (March 23, 2017), my review was added (with my permission) to the All the Wonders page about that book, as "A Second Perspective." On Thursday evening (March 23, 2017), my review was gone. On March 22, I wrote my review of The Secret Project, loaded it to AICL, and posted a link to the review on Facebook and Twitter. Then I looked on Twitter to see if others had reviewed it. If someone I know has reviewed a book I've also reviewed, I'll generally ask them to take a look at my review. Donalyn Miller and Jillian Heise added links to my review to their reviews on Goodreads. I saw that The Secret Project was featured at All the Wonders. I read their interview with Jonah Winters (the author), and agree with what he said about propaganda. I felt then (and still do) that some changes to the book would make it outstanding. I wanted to listen to the podcast and read the interview with the illustrator, but had other things to do at that moment. Because I know All the Wonders is widely read by teachers and librarians, I asked them if they could add my review so that they could use information I share when they teach or read the book. Here at All the Wonders, we strive to represent diversity and inclusion in the books we share. 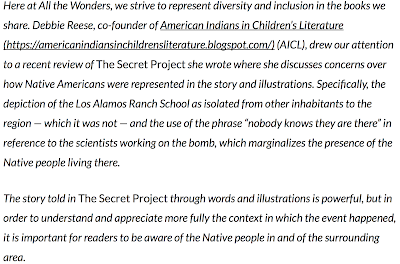 Debbie Reese, co-founder of American Indians in Children's Literature drew our attention to a recent review of The Secret Project she wrote where she discusses concerns over how Native Americans were represented in the story and illustrations. 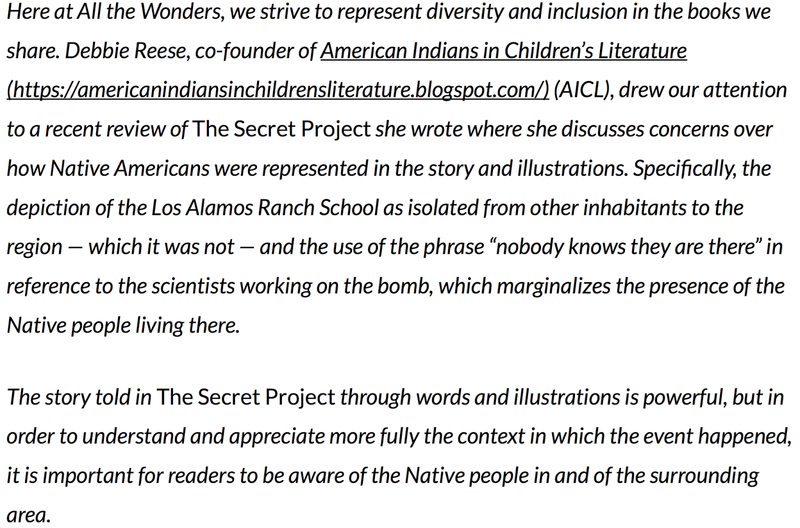 Specifically, the depiction of the Los Alamos Ranch School as isolated from other inhabitants to the region -- which it was not -- and the use of the phrase "nobody knows they are there" in reference to the scientists working on the bomb, which marginalizes the presence of the Native people living there. The story told in The Secret Project through words and illustrations is powerful, but in order to understand and appreciate more fully the context in which the even happened, it is important for readers to be aware of the Native people in and of the surrounding area. Then, I went back to All the Wonders to read the interview with the illustrator, but it was gone. A little bit later, the interview with the author was gone, too. Why were they gone? On Thursday night, I had an email from Matthew saying they had made a difficult decision to remove my review. Early Friday morning, I replied to Matthew to acknowledge what they had done and let him know that I was about to get in my car for a day-long road trip and didn't have time to write back at length about the decision. Just before I got in my car, I saw that the author and illustrator interviews were back on the All the Wonders page. As I write this post, it is Saturday morning. I'm reading through what happened yesterday on Twitter. In an email sent to me yesterday, Matthew suggested I contribute a post for All the Wonders, that consists of books I recommend. He also referenced a Twitter conversation. I haven't replied to him yet. I'm conflicted. If I say yes to his invitation, I'll be able to bring visibility to Native writers. I'm not angry at Matthew, and I hope this blog post doesn't cause him to withdraw his invitation. In posting my review at their site, All the Wonders found themselves mired in the politics of children's literature. Did Jonah Winters demand that his interview be removed? Did Jeanette Winters demand that her interview be removed? Did their publisher make demands of the team at All the Wonders? Did they make threats?! I know--that sounds dramatic--but there's back story to all this that prompts me to use the word "threat." The Secret Project is published by Simon and Schuster. As one of the Big Five, it is a powerful entity. Back on March 5, 2017, the Wall Street Journal published an article titled The 'Rock Star' Librarians Who Choose What Your Kids Read. That article is how I learned about All the Wonders and Matthew Winner. He's featured in it as one of the three men characterized as rock stars (the three strongly objected to being the focus of the article and to being characterized that way. Women had also been interviewed but were not included). The article generated a lot of discussion. Allie Jane Bruce of Reading While White did a terrific post about it. She asked some pointed questions. Are these three librarians being used by publishers as a way to get free advertising for their books? Were/are they (inadvertently) functioning as marketers for publishers? Please read the comments to the post. Among them is one from Matthew Winner. He disagreed with her remarks about advertising and marketing. He also said that he wants to increase the diversity of the podcasts at All the Wonders. In my comment to Allie's post, I recommended he add Native writers. He and I started talking, via email, about possibilities and I think one will be there, fairly soon. I also asked him, in an email, if he might add critical content to some of the pages they do at All the Wonders. He didn't say yes or no, but I believed (and still believe) that he and his team are very interested in being more diverse with what they're doing on their site. So... last week when I saw that All the Wonders had a new page up on The Secret Project, I decided to ask them to add a link to my review and was thrilled that they did. Then, as you know, they removed it. So, what happened to "A Second Perspective" at All the Wonders? Did Simon and Schuster put pressure on the All the Wonders team to remove my review? If Simon and Schuster gives All the Wonders books, did they threaten to withhold future books? If Simon and Schuster controls access to its authors and illustrators, did they threaten to withhold access to their authors and illustrators? Did they say "get rid of Debbie's review, or else"? I don't know if the All the Wonders team was pressured to remove my review, and I'm not going to ask Matthew that question. It seems to me that the team at All the Wonders was put into a difficult position. They want to offer critical content of books along with podcasts and interviews, but their effort to do so with my review didn't succeed. I've got lot of questions. Do publishers wield that much power over sites like All the Wonders? If so, that's not good, at all, for anyone. If not, then.... what happened to my review? Right now, several people are wondering what happened. The fact that diverse voices weren’t heard, valued, or represented in the WSJ article made us look more closely at the people we look to as leaders, the authors and role models we invite to our schools, the books we choose to read, review, and purchase. We need to do more, and we need to be better. If we want our students to see themselves on our bookshelves and in our programming, we need to actively work toward that goal. How can we expect the world (or the Wall Street Journal) to see school libraries as places where diversity is honored and celebrated if we are not working to make them that way? Winner's decision to use my review of The Secret Project was evidence of his wish to "do more" and "be better." But, with those words as context, his decision to delete it made the decision to use it in the first place even worse. I shared that excerpt on Twitter yesterday morning (3/29/17), again asking why my review was taken down. Kate Messner, Laurie Halse Anderson, and Justine Larbaleister retweeted it and asked the question, too. Hi everyone. I want to apologize publicly here to anyone who was offended by our decision to include Debbie’s review of The Secret Project in our feature at All Wonders and then retract it later that day. We feature one book each month in addition to our regular content, and the selected book is one that our team believes stands above the rest. We think of our features as an award from our team, and we honor the chosen book by compiling various forms of content that celebrate it. We even describe the feature to the artists involved as "a week-long celebration of your book." These words, we believe, enter us into a verbal agreement that we will shine a positive light on their work, and it is based upon this agreement that the publisher grants us permission to license their images, words, and behind-the-scenes content. I made a misstep, then, by surprising Jonah and Jeanette Winter and their publisher, Simon & Schuster, with a critique, and introducing an element of debate into the feature. After careful reconsideration of these factors, we decided to pull the post. I know now that this series of events confused and offended a number of individuals. I am sorry for that. We (myself along with the team) had the best intentions, which was to offer a “second perspective” post from Debbie, who saw something that we did not see in our reads through the book. We consider critically all of the books that we include on our site, and we welcome discussions about how they are serving readers, but our features in particular are not designed for that purpose. They are designed to give children multiple entry points into what we believe to be special books. 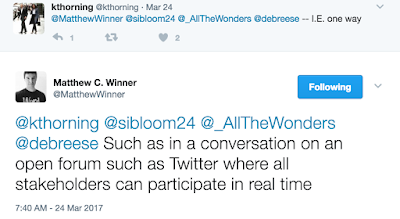 Once we came to the decision to pull Debbie’s post, we immediately communicated to her via email that we would be removing her post for these reasons and gave her an open invitation to address American Indian representation in children’s books on our site or in the form of a Twitter chat. Though we are still waiting for an official response from Debbie, it is our sincere hope that she will choose to work with us in the future to raise awareness about misrepresentations of American Indians in children’s literature. Our goal at All the Wonders is not to silence, but to raise the voices of authors, artists, bloggers, and critics in service of readers. I regret the way these events have unfolded, but I consider this an opportunity to learn from our mistakes and a renewal of our mission to build positive relationships with all of our colleagues. [We] dd not feel that the piece added to the focus of the feature and that the conversation it beckons would be better served in other contexts throughout the site. We felt that the topic begs for discussion, and that is not something that the feature is suited for or capable of. That line was particularly ambiguous (to me). He went on to say that they wanted me to write about Native writers and be a guest on a Twitter chat they host. That invitation is fine, but it is a far cry from what a Second Perspective on books can do for teachers and librarians. When they added my review as A Second Perspective, I thought of all the other books they had featured and that could use A Second Perspective. One, for example, is Laura Jimenez's perspective on Telgemeier's Ghosts. Frankly, I was excited at the possibilities. Do I want to contribute a post about Native writers to All the Wonders? I'm not sure. I still think that their decision not to proceed with A Second Perspective is a mistake. A week-long celebration of a book is a mistake if there are concerns about that book's representations of marginalized people. Saying that, they recognized Pueblo children as readers. Indeed, they recognized all children who live in that area who know more about the history and cultures of the area than Jonah and Jeanette Winters told them in The Secret Project. As Winner's response says, their decision to add A Second Perspective surprised Jonah and Jeanette Winters, and Simon and Schuster, too, because of his verbal agreement to shine a positive light on their work. That, I believe, explains why their interviews disappeared from the site when A Second Perspective was published. Once that second perspective was removed, their interviews went back up. Those two people and their publisher set the terms under which Matthew Winner and the team at All the Wonders will speak about their books. That's not surprising, but Winner is a librarian by training and profession. From that position as a librarian, he is providing a huge service to teachers and librarians who read All the Wonders. But is it a service to his profession? I think it is a service to publishers. With that as a fact, his words in the SLJ article ring hollow. Doing better doesn't mean just talking up the good. Books get better when we talk about the problems in them, too. To clarify...were you asked by S&S to remove the original images/words/content after you'd added Debbie's Second Perspective? S&S expressed their regret, but we as @_AllTheWonders maintain full autonomy over what we create and what we share on our site. S&S was very specific about saying they would not pressure us to take down the post. A reader wrote to ask me about Vivian and the Legend of the Hoodoos, written by Terry Catasus Jennings and illustrated by Phyllis V. Saroff. Published by Arbordale Publishing, it came out in 2017. I specifically look for books set in the present day, in which a Native child and his parents or grandparents are doing something together, whether it is specific to their nation or not. I like to see traditional story brought into that story, in a natural way, with the characters speaking, in a natural way. 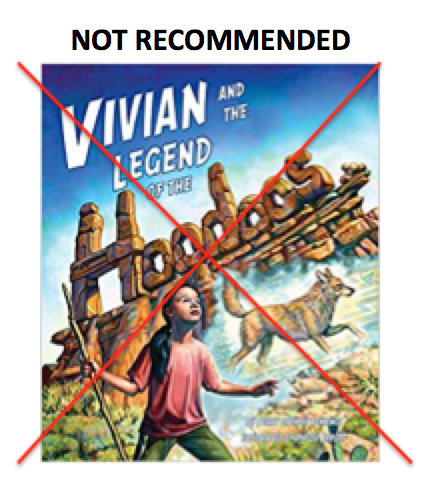 And so, I like that Vivian and the Legend of the Hoodoos is set in the present day. If it was well done, it could have been a mirror for Paiute children who pick pine nuts with their families. If it was well done, it could have been a window for non-Paiute children to learn a little about Paiute people. But, I don't think it is well done, for several reasons. As the synopsis says, Vivian is out with her grandmother. They're going to pick pine nuts. As they set out, her grandmother reminds her that they should leave some for others. Vivian remembers a legend her grandma had told her, about "the Old Ones" who took everything. Others asked "the god" named Sinawav, or coyote, for help. Using "the god" to describe coyote bothers me. Do the Paiute's think of coyote as a god? That bothers me, too. 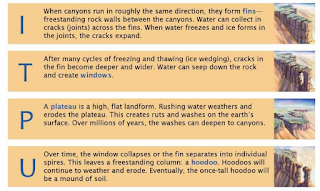 If the hoodoos are, in fact, amongst the stories the Paiute people tell about how their land came to be the way it is, would that story be spoken of that way? It is possible, of course, but I wonder. Would we see something similar in a story with a Christian grandmother and her grandchild about something important to how the Christian world came to be? Vivian is impatient. Her grandmother reminds her to ask the trees' permission to pick their fruits, but she replies that she'd done that last year. Her grandmother harrumphed, and asked the trees' permission herself, and they got started picking the nuts. "Things from long ago are sacred. You shouldn't remove them." Some things from long ago are sacred. Some pots from long ago might be sacred. Sacred or not doesn't matter. When you're on a reservation or at a national park or lands held by the US government, it is against the law to remove such things. For centuries, people have taken things like that. Some ended up in museums. Today, there is a federal law by which such things are returned to the tribal nations they were taken from. And, people who take them, today, are arrested and prosecuted for doing it. "Our legends say we have always been here." That doesn't sound the way a grandma would speak to her grandchild in a natural, one-on-one conversation, and it doesn't fit with what Vivian already knows (the story about the hoodoos). I also don't think a grandma would use the word "legends" either, to refer to their stories. I can imagine a grandmother speaking that way to an audience of non-Native people in a storytelling format, but again, I don't think she'd say "legends." It is possible, of course, but it feels very much an outsider trying to speak as an insider, but not getting a strong sense of how we talk to each other. Vivian's grandmother goes on to tell her a story about "those who had lived on that mesa." Again--this doesn't feel right. Vivian knows that hoodoo story but not any of this cultural information about pine nuts, songs, drying meat, sewing skins, and making bows and arrows? As the two walk in the runs they find many of the things from the story Vivian's grandmother has just told her about (like an awl made of bone and a metate). They return to picking nuts, but before she does, Vivian asks the trees' permission, and when she leaves, she thanks them for their fruit. Did you figure it out? The answer is Paiute Indian Tribe of Utah. See why "the name" isn't quite right? The puzzle ought to be something like "an acronym for the Paiute bands in Utah." In the book, Glenn Rogers and Clarence John, of the Shivwits Band of the Paiute Indian Tribe of Utah, are thanked for verifying the accuracy of the information about Paiute culture and history. 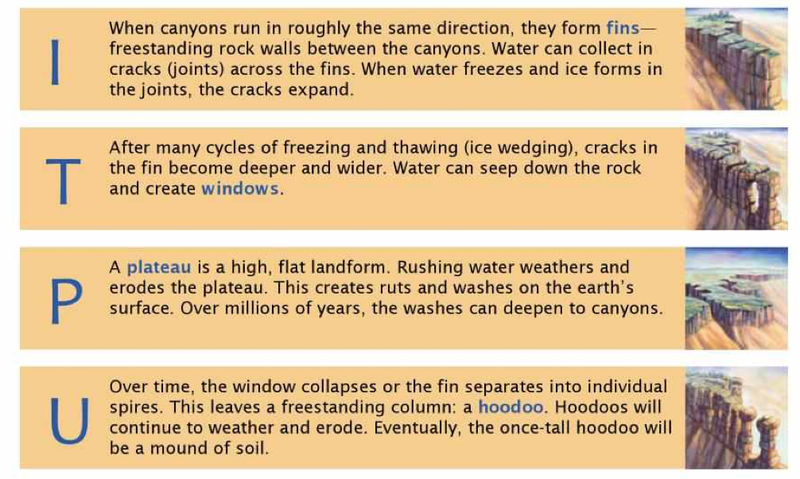 The problems in Vivian and the Legend of the Hoodoos are not about accuracy. They're about bias and voice. As such, I do not recommend it. Eds. Note on Oct 19, 2017: For a more in-depth review than the one below, see Still Not Recommended: The Secret Project. Eds. Note on 3/27/17: This review (below) was posted on a popular children's literature website but removed. For details, see What Happened to A Second Perspective at All the Wonders? 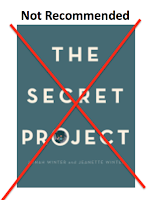 A reader wrote to ask if I've seen The Secret Project by Jonah Winter and Jeanette Winter. It was going into my "Debbie--have you seen series" but when I looked it up, I got a copy right away. Why? Because it has several starred reviews, and because its setting is so close to Nambe Pueblo (my tribal nation, and where I grew up is about 30 miles away). The Secret Project came out in February of 2017 from Beach Lane Books, which is part of Simon and Schuster. It is a picture book for kids in grades K-3. Mother-son team Jonah and Jeanette Winter bring to life one of the most secretive scientific projects in history—the creation of the atomic bomb—in this powerful and moving picture book. At a former boy’s school in the remote desert of New Mexico, the world’s greatest scientists have gathered to work on the “Gadget,” an invention so dangerous and classified they cannot even call it by its real name. They work hard, surrounded by top security and sworn to secrecy, until finally they take their creation far out into the desert to test it, and afterward the world will never be the same. The Secret Project is getting a lot of starred reviews for its content and illustrations. Of course, I'm reading it from a Native point of view. Or, to be more specific, the point of view of a Pueblo Indian woman whose ancestors have been in that "remote desert of New Mexico" for thousands of years. That school was the Los Alamos Ranch School. The boys shown are definitely not from the communities of northern New Mexico at that time. In the Author's Note, the school is described as being an elite private academy (elsewhere, I read that William Borrough's went there). It was, and its history is interesting, too. What bothers me about those two pages, however, is that they suggest there was nothing there at all. It is like the text in Wilder's Little House on the Prairie. 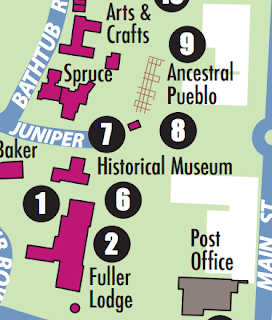 All through that area, there are ancestral homes of Pueblo Indians. Depicting the school that way adds to the idea that the site where the bomb would be developed was isolated, but depicting it that way also erases Native people. The government wanted the school and that area to do research, so the boys school had to close. The scientists moved in. We read that "nobody knows they are there." Who is nobody? It was, as the Winter's tell us, a secret project. But people who lived in the area knew it was there. They may not have known what was going on, but they knew it was there. If, by "nobody," we are meant to think "citizens of the world minus those who lived there" then yes, nobody knew (but again, nobody is relevant, even to them). We read that in "the faraway nearby" places, people didn't know the scientists were there. Artists, specifically, don't know they are there. The first image is meant to represent Georgia O'Keefe who lived in Abiquiu, which is about 50 miles away. It--I guess--is a "nearby" place. The text on that page reads "Outside the laboratory, in the faraway nearby, Hopi Indians are carving beautiful dolls out of wood as they have done for centuries." Hopi? That's over 300 miles away in Arizona. Technically, it could be the "faraway" place the Winter's are talking about, but why go all the way there? 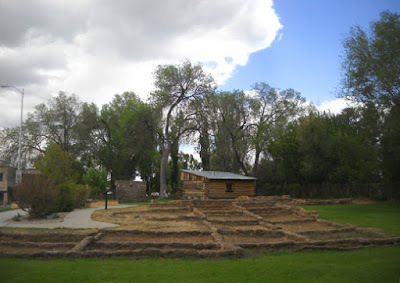 San Ildefonso Pueblo is 17 miles away from Los Alamos. Why, I wonder, did the Winter's choose Hopi? I wonder, too, what the take-away is for people who read the word "dolls" on that page? 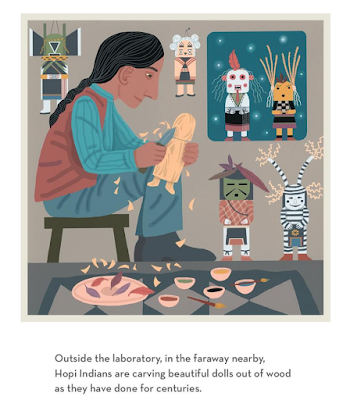 On the next page, one of those dolls is shown hovering over the lodge where scientists are working all night. What will readers make of that? On an ensuing page, we see the scientists take a break by going to "the nearby town" on what looks like a dirt road. That town is meant to be Santa Fe, and that particular illustration is meant to depict the plaza where Native artists sell their work (there's a Native woman shown, holding a piece of pottery). It wasn't a dirt road, though. By then, Santa Fe had paved roads. Showing it as a dirt road contributes to the isolated nature of where the scientists were doing their work, but it isn't accurate. Like many reviewers, I think the ending is provocative. The Secret Project ends with the test of the atomic bomb, at the Trinity site. As the bomb explodes, the scientists watch from a bunker, far away. The bomb's explosion fills the last page. That's it. No more story. I think some readers will think "AWESOME" and others will think it horrible. The author's note is next. It has information about the radiation that explosion left behind, how long it will be there, and that now, studies of the cancer it caused in citizens near there, are being done. I think children should have books about subjects like the development of the bombs that destroyed Hiroshima and Nagasaki, but they ought to be inclusive of -- in this case -- Native peoples who lived and live in and around Los Alamos. As is, the book yanks those readers out of the book. And, it misleads readers who don't know the area or its history. I suspect that people will defend it, telling me or others that "it is important that kids know about the bomb" and that my concern over its misrepresentations are of less importance than knowing about the bomb. With that defense, however, it will be among the ever-growing pile of books in which this or that topic is more important than Native people. The irony, of course, is that this universe of books is one in which books are written and published by people who are occupying Native homelands. 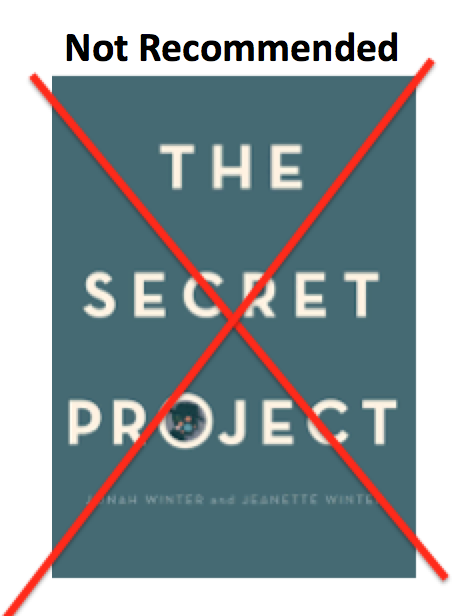 Published in 2017 by Beach Lane Books/Simon and Schuster, I do not recommend Jonah and Jeanette Winter's The Secret Project. "I have another issue with the Hopi panel: the majority of Hopi men during the 19th and through the mid-20th century had cut hair with bangs, quite distinct and different from the carver depicted. This is a simplistic stereotypical rendering of a Native man." 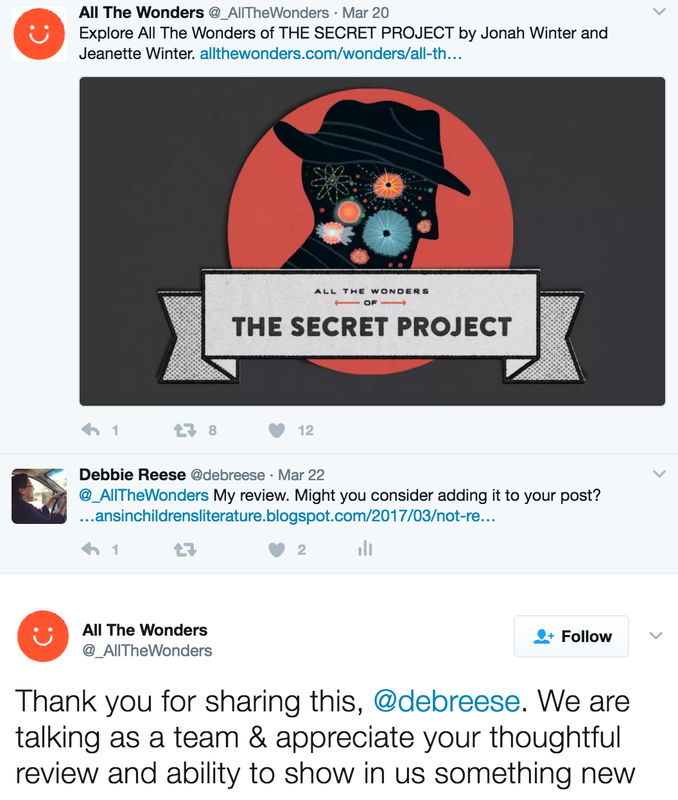 The folks at All the Wonders asked if they could put my review on their page about The Secret Project as a "Second Perspective." That's a terrific idea! Readers there can listen to the podcast review, read interviews with the author and his mother--and read my critical review, too. Here's a peek. Go there and see it, and thanks, All the Wonders for adding it. My review is no longer at the All the Wonders website. For details, see What Happened to "A Second Perspective" at All the Wonders?